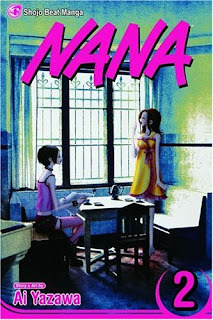 In this second volume of the Nana manga series, the two Nanas find themselves bound for Tokyo, and they end up sitting next to each other on the train. Unfortunately it is snowing, and the train is chugging along at a snail's pace, adding hours onto their trip. Irrepressible Nana Komatsu's excitement runs unabated, however, and she chats away at the more introverted Nana Osaki, who seems to find her endearing in spite of herself. The same lighthearted, humorous tone of the first volume is also present here, along with the more serious themes of women making life decisions and trying to realize their dreams. I particularly enjoyed watching the Nanas' friendship develop - it reminded me of those odd friendships that manage to happen even when you appear to have nothing at all in common with the other person - there's something there that clicks, and you become friends all the same. I continue to get the feeling that the stage is still being set for what is to come. The players are moving into their places, and the plot is thickening. I'm looking forward to seeing the story continue in the next volume. That's true. but I never thought it was gonna be that long! 1) the amount of cigarettes they smoke.Really is too much. Yes! I've been meaning to mention how annoying the cigarettes are. Is that REALLY necessary, especially in books targeted mainly to younger readers? Argh! And yes - the clothes are amazing. You think she's copying designs she likes, or making them up? Wonder if designers get ideas from books like these.